a book chick: "Just Mercy"
my take: Profound. Important. Essential. Imperative. What word best sums the necessity of Bryan Stevenson's voice? Right up there with Pope Francis, his is a most needed voice for the poor. I think he deserves a Nobel prize. 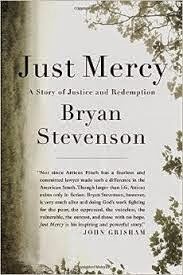 In this highly readable memoir/look inside the U.S. justice system, Mr. Stevenson shows how being poor and black in America can lead to a long life behind bars - whether you've committed a crime or not. I laughed (he's self-depricating), I cried (bad stuff happens to good people and sometimes great things happen in bad situations), and I came away a better person (not just my awareness but a deep desire to join in this effort any way I can). So, yeah, this gets my highest recommendation.